I have always been intimidated by mixing patterned fabrics. When I tried, it never quick looked right. More like something out of the 70's, can you picture tye dye and psychedelic all jumbled up. Not very put together. Now, I really love this fabric! Look familiar? Normally, I would have NO CLUE what to put with it. I could have conquered this a LONG time ago! While at Haven I took this workshop called Design Studio. I think it was one of the best workshops I took. I took it with my friend Sallie from Texas Cottage. She was such a joy to meet! 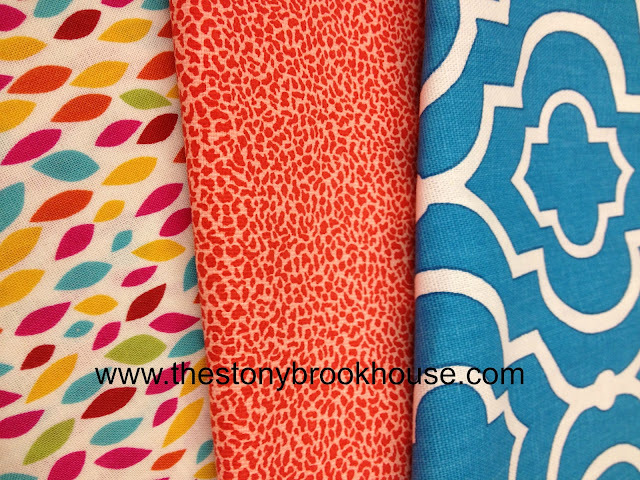 These are the fabrics I chose to go with the bench in my office. 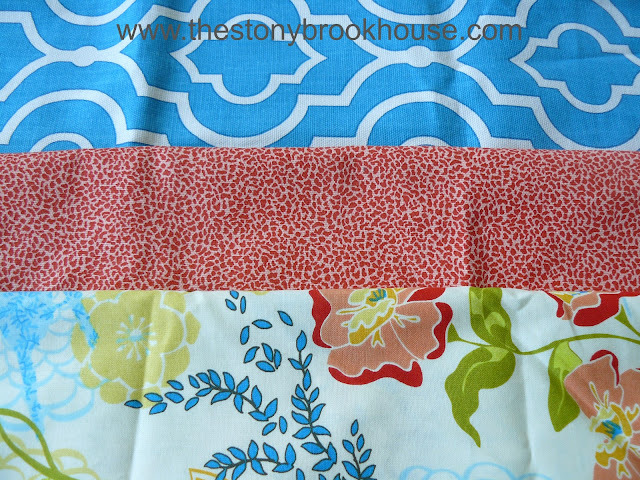 So, let's go over why I chose these fabrics. knew I had to have it in the office. The orange fabric... Well, it's orange, enough said! But I also think the pattern is kinda cool, it reminds me of a mini cheetah print. the blues are almost the same too! The floral fabric was not my first pic. I kinda picked them out of order. 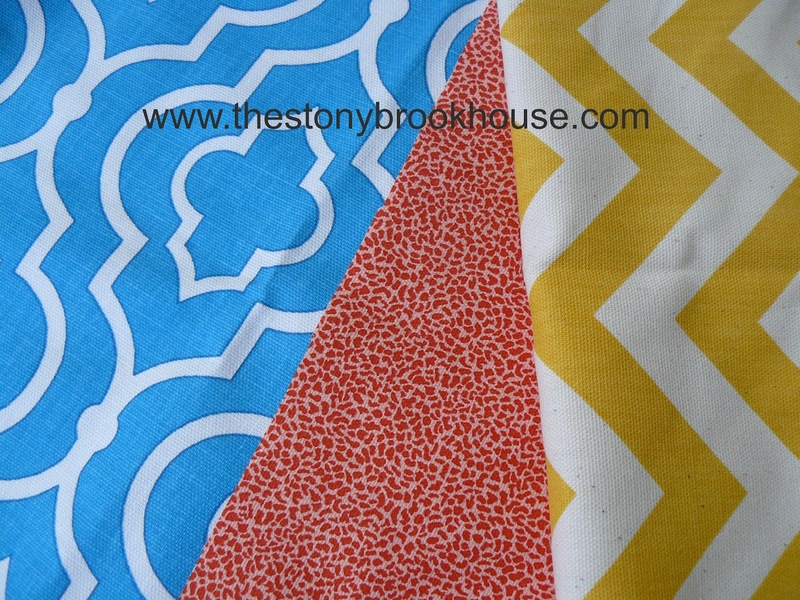 See, I actually picked the yellow chevron before I found the orange. Then I went look for a small print and found the orange. This was my first attempt at mixing patterns in a LONG time. I knew something wasn't working. So, I went back to the formula and realized the yellow chevron was kind of the same size as the blue and I was trying to put two graphics together. Pick out three fabrics. That's kind of a rule with all decorating. They say...(whoever they is) to always group things in odd numbers. You need a lead fabric, something with lots of color and movement. Doesn't that sound so designer-ish? I love it! In the workshop they said florals do this best. Then you need something graphic. Something medium to large, they recommended more of a neutral like brown or black, but I'm a bit more colorful. The blue worked for me. 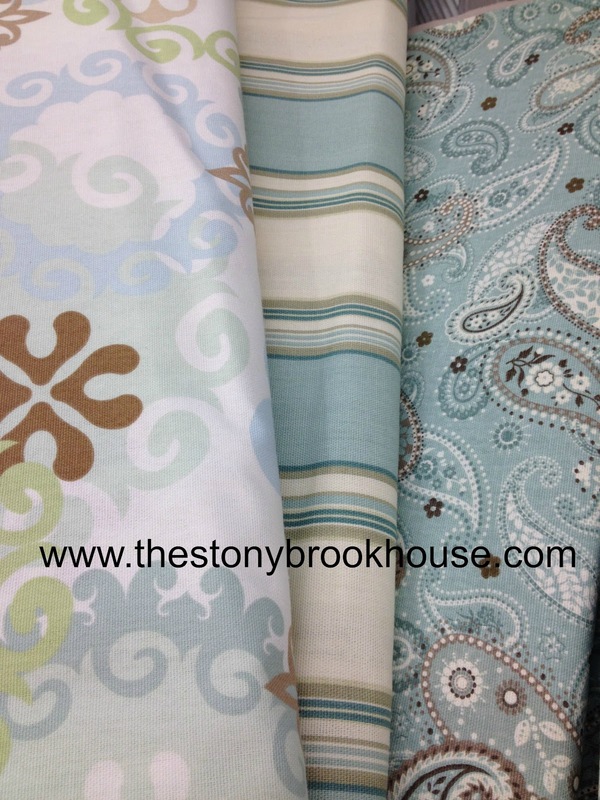 Now, if you are decorating a room, they suggested you could also add a large monochromatic fabric. Say, for curtains or a piece of furniture, something like that. Ok, so let's make the formula, simple. So, did I follow the formula to a "T". No, not really, but that's where your own style come in. But, it sure did help me A LOT! Here are two pics that I took with my phone while looking for that floral fabric. 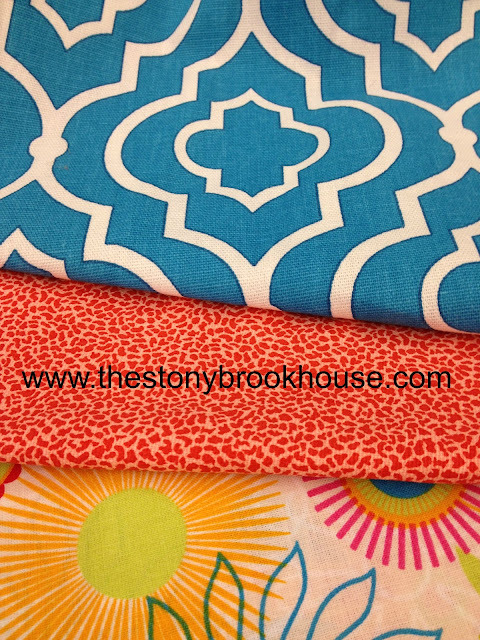 Colors are coordinating, but the print on the right is in my opinion too small. Again, the colors are coordinating, but I felt that the pattern was too whimsical, not what I was going for. So, when I found the floral, I knew it was just right. While I was shopping, I found that some of the fabric companies would print fabrics and do the coordinating for you! I hope this has help you as much as it has me! I feel empowered to conquer the fabric store! Well, I love how my pillows came out. You can look at how I made them here. So, do you think my fabric choices passed the test? Genius! Thanks so much for e fabulous tip!! Hi Christine! Thanks for reading! Thanks for sharing with us the formula! 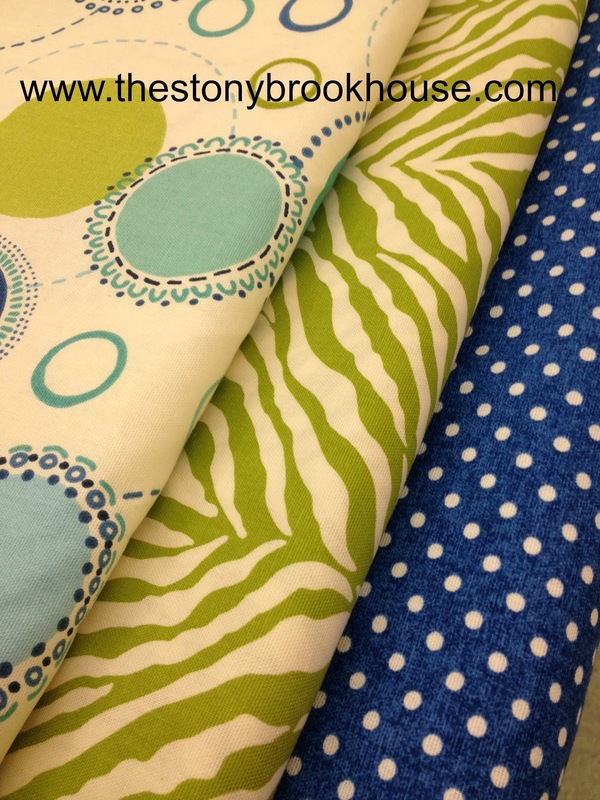 I love the fabrics you picked! Great post! Hi Cristina, thanks so much for stopping by and for your encouragement! I love them too!! I wish I had gone to that seminar at Haven...I heard several folks talk about how good it was. Thanks for sharing the "formula" with us. There are so many choices out there that having some guidelines kind of narrows it down for us. Love your pillows...they are really cute. Hi Miss Kitty! It's always a joy to hear from you!! You always know how to make me smile! You're exactly right--I generally pick the floral first. 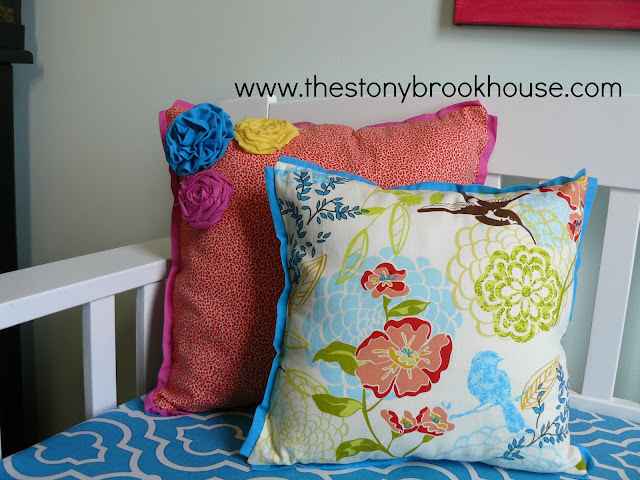 I did the same with my living room--using the colors in the pillows I won as a jumping-off place. 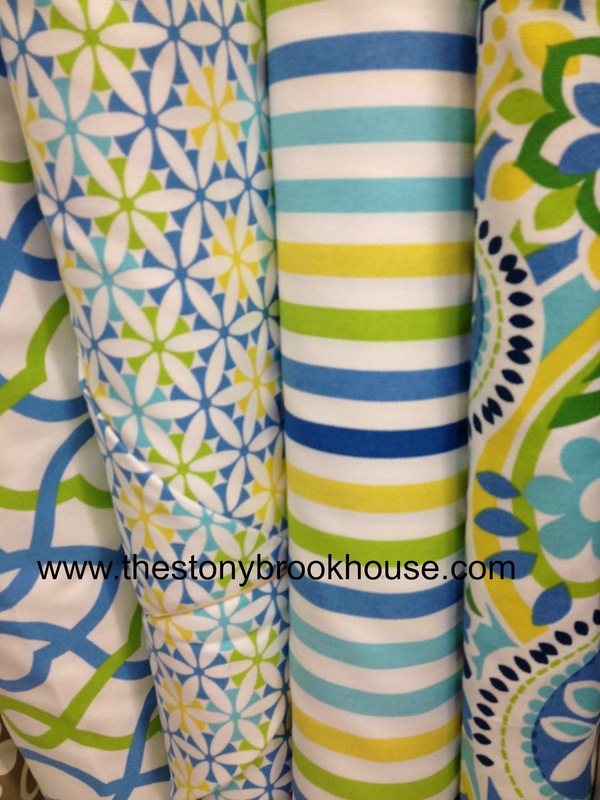 The big print is on my club chair, the small on the pillows, and the solid on the couch. The tiny print will be on the settee, when I can afford to have it reupholstered. Your combo looks great! Hi Jodie! Yes! I got all of the fabric at Jo Ann's Fabric store. 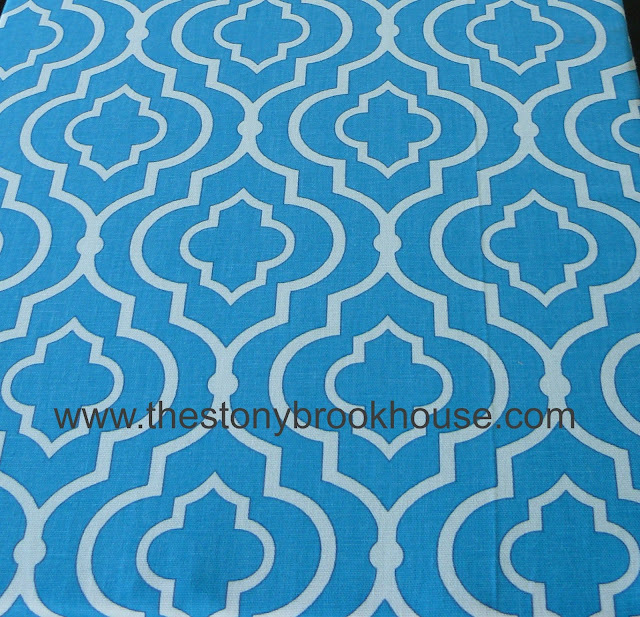 The blue fabric was in the Home Decor area. I wish I had your email so I could know for sure that you got this! I got it. Thanks!! My Joann's does not have it. 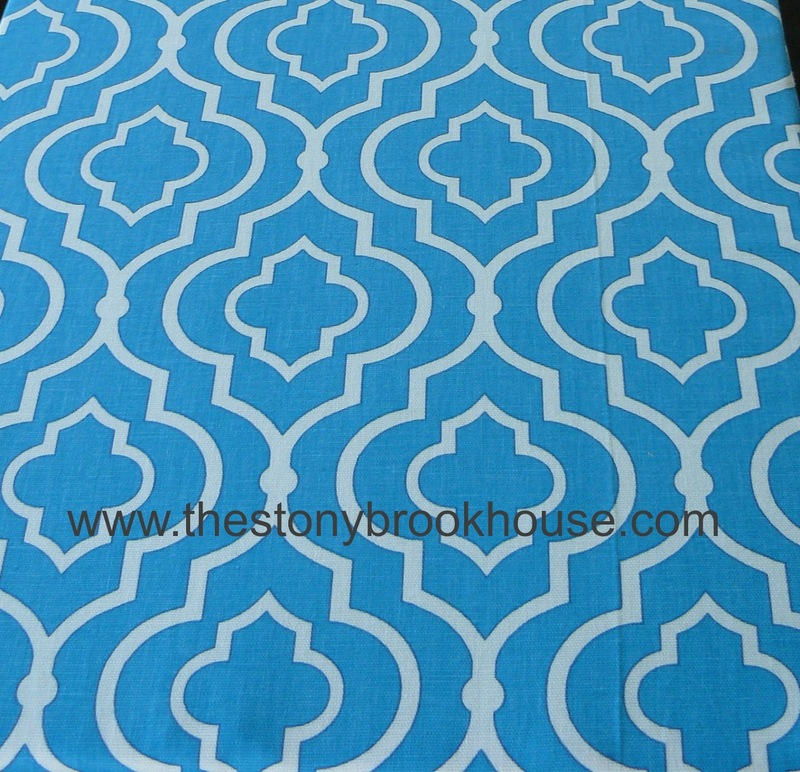 I have been looking for a pattern like this in yellow for a bench.. no luck. Lots of "close, but not quite right" fabrics out there. I ended up going with something a little different but would love to find this one for a different project. I just love that pattern and am finding myself adding it here and there all over the house. I really loved seeing this post from the past! I did not go to that workshop at Haven but thanks to you now I have the basic info in a nutshell! It has made it so much easier!